U.S. Bioterrorism-Detection Program Is Unreliable, Report Finds : The Two-Way The Government Accountability Office says that Homeland Security's BioWatch system, deployed in 30 U.S. cities, has issued dozens of false alarms since its introduction in 2003. 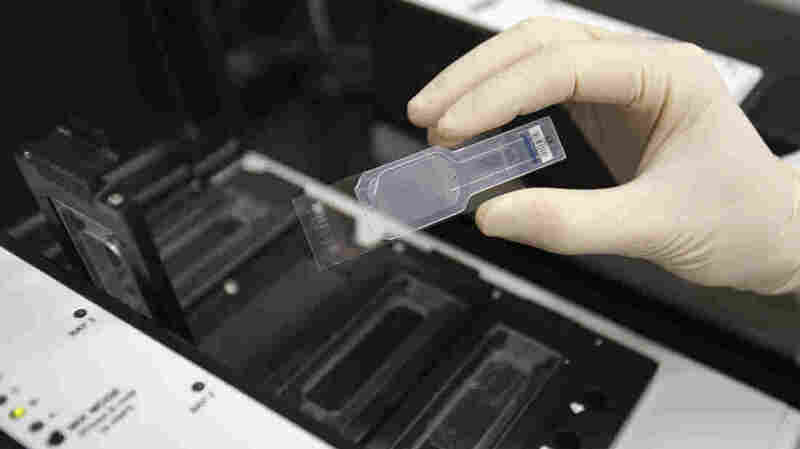 A biologist holds a slide prepared for testing in a micro array for biological hazards at the Lawrence Livermore National Laboratory in Livermore, Calif.
A government watchdog says the Department of Homeland Security can't say for sure whether its system to detect a biological terror attack actually works. In a report released Monday, the Government Accountability Office says the BioWatch system has issued dozens of false alarms since its introduction. It recommends that Homeland Security, which oversees the system, hold off any upgrades until the department can be sure of BioWatch's current capabilities. The BioWatch system was implemented in 2003, two years after five people died and 20 others were sickened by letters containing anthrax spores. The system involves aerosol collectors deployed in 30 U.S. cities, including on top of buildings and in subways and airports. Personnel remove filters from each of the detectors and check them for the presence of airborne pathogens, a process that can take up to 36 hours. The program operated with an $87 million budget last year, according to the GAO. Homeland Security has proposed replacing the manual detectors with a more automated system — what it calls a lab-in-a-box — that would reduce detection time to six hours. But the GAO says Homeland Security hasn't developed performance requirements to adequately test the current system and is unable to "draw conclusions about the system's ability to detect attacks." The BioWatch system has been plagued by "false positives," totaling 149 between 2003 and 2014, according to the GAO. "Health and public-safety authorities 'need to have assurance that when the system indicates a possible attack, it's not crying wolf.' U.S. Homeland Security officials cannot credibly offer that assurance, he said. 'You can't claim it works.' "
"The Department of Homeland Security's BioWatch program is the only federally-managed, locally-operated nationwide bio-surveillance system designed to detect select aerosolized biological agents and remains a critical part of our nation's defense against biological threats. While DHS appreciates the GAO's effort in identifying the best practices of the BioWatch program, DHS does not agree with all of GAO's characterizations of our BioWatch efforts. Nonetheless, the Department concurs with the four recommendations in the GAO report, and has already implemented or is in the process of implementing efforts that will fulfill the recommendations."